Tell me a bit about your coaching role(s)? I currently coach an U16 netball squad with teams entered in local and county levels. We train weekly with regular weekend fixtures which I also attend. I am the lead coach for the age group and work with an assistant alongside me to develop areas of play and progress skills learnt in previous training. I also coach my club senior teams through summer training once a week in preparation for the season ahead. 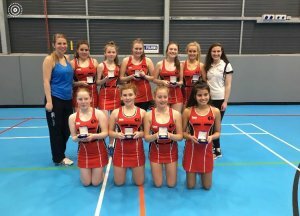 I coach netball because I have been involved myself from a young age and always benefitted from coaches who have helped me develop as a team player and an individual. I have learnt a lot and expanded my knowledge by learning from my previous coaches and am able to pass this on to a younger generation. What have you gained from doing this? I have met many inspirational people through coaching and also gained knowledge and different teaching methods to use effectively to engage and develop different girls / ladies who attend sessions. I have developed my own self-confidence when leading different groups and the confidence to handle conflict and resolve this efficiently and effectively. Have you overcome any barriers to coach? When taking up coaching U16's it does demand a lot more time in terms of organising teams, liaising with parents, etc. In some cases I have had to make the decision whether to play myself or take the girls to matches so making sure you understand all that's involved before and being prepared to compromise. What would you say to someone who's thinking of getting into coaching? Anyone can coach, you don't have to be the best at the sport to be a good coach and help others. You can get involved at all levels from grassroots, different ages, performance and trying different opportunities can help you decide where you are best suited and where you can develop as a coach and those can develop with your guidance! It's very rewarding and you can give as much or as little as possible with other commitments!